This dip into semantic coding will explain ontologies and how to create relationships within your data using the GRAKN Knowledge Model. This is a short blog post to introduce the concept of an ontology for those who are unfamiliar with the term, or who have previously encountered explanations that make little or no sense, as I have. I’m aiming to "democratize knowledge of this topic" as one of my colleagues put it. This makes more sense to me, as I’m familiar with object-oriented C++, and it doesn’t sound that unlike it. I thought I’d illustrate the definition with an example using an ontology in GRAKN.AI to define objects, express their properties, and show how the objects relate to one another. Still with me? I hope I’ve not slipped into the territory of confusing semantic terminology just yet (by the way, please see the end of this article for more examples of ontological explicative horrors). entity - Represents an object or thing. For example, a person, a man, a woman. relation - Represents relationships between things. For example, a parent-child relationship between two person entities. role - Represents the roles involved in a specific relation. For example, in a parent-child relation, there are roles of parent and child, respectively. resource - Represents the properties associated with an entity or a relation, for example, a name or date. Resources consist of primitive types and values, such as strings or integers. The sub keyword expresses sub-typing, so person sub entity is simply describing that a person is a sub-type of the built-in Graql entity type. In the ontology above, there is one entity sub-type, or category of object, which is a person. The person can take one of two different roles in a parentship relation with another person entity: a parent or child role. The parentship relation has a single property associated with it (a date of birth), while the person entity has a number of properties, such as names, age, and gender. Of course, this is a contrived example, designed to show the basic elements of a Grakn ontology. It is possible to build a more extensive hierarchy through inheritance (entities to represent a man or a woman could inherit from an abstract person entity for example) and to introduce additional relations and roles (for example, marriage). 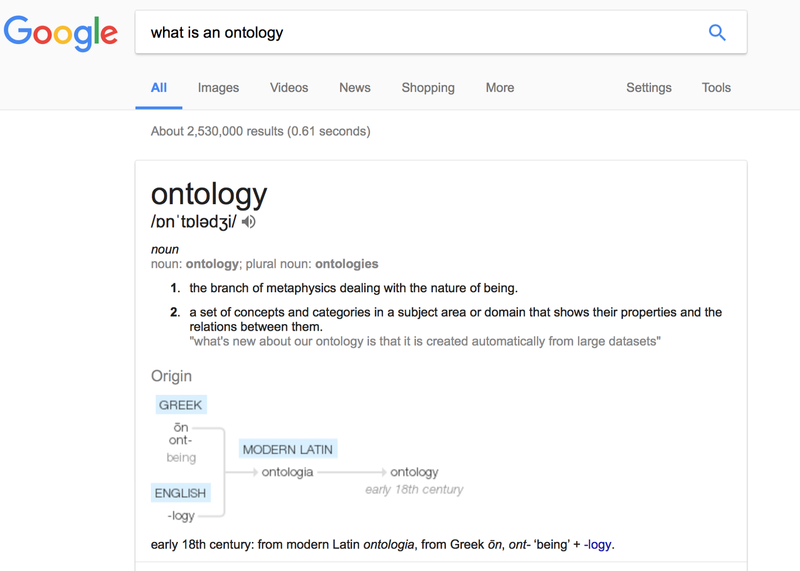 Why Do We Need an Ontology? We need an ontology to allow Grakn to discover whether the data has any inconsistencies (also known as validation) and to extract implicit information from data (known as inference). As an example of validation, consider a glitch in the data whereby a person was incorrectly named as a parent of themselves. In adding the data, Grakn would spot that a person entity was attempting to take both parent and child roles in a parentship relation, and would flag it up as an inconsistency. Graql uses machine reasoning to perform inference over data types and relation types, to discover implicit associations. A nice example is to use the gender of a person to infer more specific details of their role in a parentship relation (whether they are the mother or father, or daughteror son). If the parent is male and the child is male, the roles are father and son. If the parent is female and the child is male, the roles are mother and son. If the parent is male and the child is female, the roles are father and daughter. If the parent is female and the child is female, the roles are mother and daughter. The rules are applied by Graql across the dataset to build new information from what is already contained in the data. To find out more about how to work with the Grakn knowledge model, we recommend you take a look at our documentation: in particular the Quickstart Tutorial and Knowledge Model guide. If you’re stuck or need to talk to us, please join our growing Grakn Community. I hope this post has simplified a difficult topic to describe. As the article is provided for free, we are sorry that we can’t offer you a refund if I failed. But let me know in the comments. If you liked this post, please take the time to recommend it or leave us a comment.